​Hello and welcome back to another episode of the Art of Business English. Over the next few weeks I will be dedicating the episodes to working on some techniques for giving a solid presentation. This series is perfect for intermediate level students who want to work on improving their presentation skills and gain more confidence giving a presentation in English. If you have to give presentations at work, whether it be to a small or large group on varying topics then this series is perfect for you. Today, we are going to start with the basics and look at the language and techniques we can use to open a presentation. OK, let’s take a look at the type of language we need to open a presentation. As with most things, presenting is a skill, so once we have all of this information clear we can practice and improve quickly. Remember, planning is essential. Once you have memorised the language and the structure then in the future you will be able to give more spontaneous presentations and you will feel a lot more confident. Before we can start our presentation introduction we need to understand the purpose and structure. Put simply our presentation introduction, introduces the speaker and the outline and points to be discussed in our presentation. With this in mind, we need to have the objective and points of our presentation clear before we start to work on the introduction. All presentations should have a clear communicative objective and message. You need to ask yourself, what is the message that I am trying to convey to my audience. If the message is not clear, then the presentation will most probably not go well. Secondly, you must be very clear with your audience, guide them with signposting language. I’ll look at this in more detail later. However, you should follow the old rule, “tell them what you are going to say…” “tell them…” “tell them what you said…” This can also be summarised as preview, give and review. So, the preview stage is what we are going to focus on today. The give stage is the body of the presentation and the review stage is the conclusion. Right, with our introduction, we are going to do two main things, introduce ourselves and then introduce our presentation while listing the main points that will be discussed during the presentation. We can also give some indication of how long the talk will last and finally some rules for questions. To be clear, when we list the main points to be discussed, we need to use very short and concise language with zero detail. Just the main idea, no examples. When we set the rules for questions we have really only two options. Questions can be asked during the talk, or you will take them at the end of the talk. It is good to let your audience know what you prefer. Depending on the type of talk you may prefer one over the other. If you are giving a sales presentation to a small number of people, you may encourage your audience to interrupt you with any questions. On the other hand, if you are presenting to a large group or at a conference, you should take questions at the end. This is to ensure you stay on point and don’t get distracted by too many questions. Well, there you have an overview of the purpose and structure of an introduction. To recap, we need to introduce ourselves, then we introduce the topic of our presentation. Following on from that we list the points that will be discussed during the presentation. Finally, we give an indication of how long the presentation will last and the rules for asking questions. Simple, right? Let’s move on to the next part of the episode, where we look at the type of language we need to open a presentation . In this part of the episode I am going to breakdown the language that you need according to the different function. Introducing yourself Hi, my name is Andrew. Good morning, as some of you may know my name is Andrew. I’m chief analyst here at Deloit. Giving thanks Thank you for having me. It’s a pleasure being here. Structure and signposting I’ve divided my talk into (three) parts. My talk will be divided into (four) parts. Well, there you have a good overview of the key language you need to introduce your presentation. These are the building blocks you need to work with to structure your introduction. All you need to do is adapt your topic to these structural elements and you will quickly have an effective and clear presentation introduction. In the next part of the episode I am going to show you how to structure this into dialogue. You should always plan and write out your presentation before you actually start with your PowerPoint. Many people make the mistake of building their presentation in PowerPoint before they have built their presentation outline in Word. Let’s take a look at how we can put this dialogue together. Here you can simply put the pieces together and structure your introduction using the language I have provided for you. Remember, everything should be clearly linked to your message or communicative objective. Also, remember that we must tell people exactly where we are going, keep everyone on the same page. Make sure there is a clear path to understanding your message. So, here I want to outline a scenario, this will make it easier to see the introduction in context. John Briggs will be our presenter today. He is going to give a presentation on sales data from the Christmas sales period. The objective of his presentation is to inform the management team about the results of the Christmas sales period and reflect on the sales data obtained. Hello and good morning everyone. As most of you know I’m John Briggs, senior sales analyst. It’s a pleasure being here today, and I look forward to sharing our Christmas sales data with you. The purpose of today’s presentation is to share the Christmas sales data. Firstly, I’ll be looking at the results of our Christmas sales campaign, then I’ll go on to discuss current market trends and finally, I’ll make some forecasts heading into the new year. I expect my talk to take about 20 minutes, and there’ll be time for questions and extensive discussion at the end. Well, there you have a very short, but clear introduction to a presentation. As you can see, we have followed the presentation introduction structure. Let’s break it down. Welcome Hello and good morning everyone. Personal introduction As most of you know I’m John Briggs, senior sales analyst. Expressing purpose The purpose of today’s presentation is to share the Christmas sales data. Taking questions there’ll be time for questions and extensive discussion at the end. Well, that brings us to the end of this episode and the first part in this series. So, reflecting on what we have learnt today, let’s review. Before we start preparing our presentation we need to be clear on the communicative objective or message of the talk. Once we have this in mind we are able to structure the ideas around what we are transmitting to our audience. Secondly, we need to make sure we structure and outline our presentation in Word first, before we start with PowerPoint. Remember the golden rule. Tell them what you are going to say, tell them, then, tell them what you said. Finally, to write out an effective and clear introduction, you just need the expressions and outline from this episode. If you are an AOBE premium member then you can download a copy of the transcript and guide. If you are not yet a premium member, send me an email and I will make sure you get a free 3-month trial. Stay with me for the next few weeks as we cover some basics for giving presentations. What you can all do now is go through this episode, write up your presentation introduction and send it to me. I will be more than happy to check it for you. If you want to join us over at our private Facebook group then please get in touch. 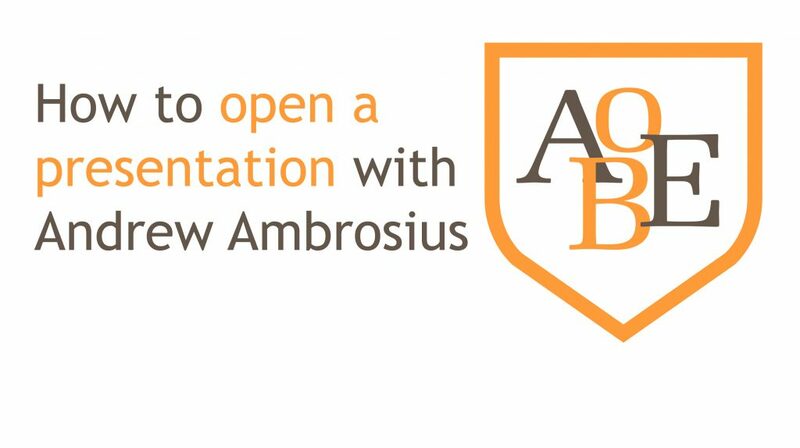 I will be more than happy to review your presentation introductions recorded and uploaded to our Facebook group. Well, till next week, have fun practicing your presentations and I’ll see you all soon.